According to a 2014 survey, women start worrying about aging at the age of 24. The biggest concern? Eye wrinkles, hands down. Over three-quarters of respondents—76 percent—stated that they were most anxious about fine lines and wrinkles showing up around the eyes. If this sounds like you, we have great news for you. Recently, we added a new ingredient to our Anti-Aging Eye Cream: larch tree extract. Not only that, but we use larch tree cells from plant cell cultures, which are super potent! 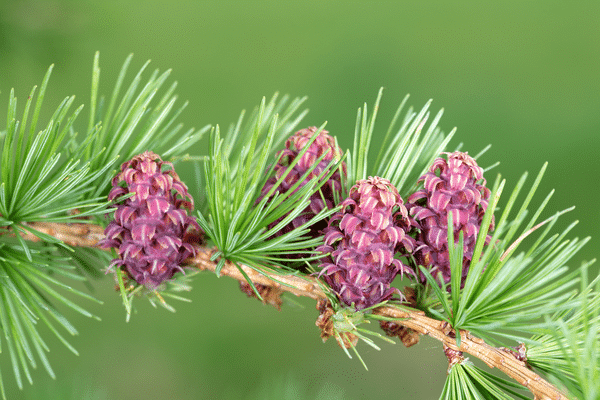 What is Larch Tree Extract? The larch tree is a type of conifer that grows in the mountains of the northern United States, and in Canada, Russia, and Scandinavia. These are the skinny, tall trees you see if you go camping at higher elevations. Often, they will have several feet of bare trunk before the branches begin, particularly if they are mature trees. Larches are often referred to generally as “tamaracks,” which is a particular type of larch found in the eastern United States. In the Pacific Northwest, the tree is typically called the “Western larch.” One tree can get up to 140 feet tall, and though it belongs to the conifer family—most of which have evergreen leaves—it actually loses its leaves in the fall. The leaves are still needle-like, just like an evergreen’s, but they turn a brilliant yellow in the fall and drop from the tree. Like the evergreens and spruces, the larches have cones that contain the seeds and usually fall to the ground in the fall. The wood is hardy and waterproof, and often used for building boats, posts, fencing, coffins, roof shingles, and interior paneling. The trees are long-lived, and may go on for 500 years or more. They have a hearty nature, and are said to be able to withstand moderate fires, and are usually among the first to return after a bad fire. Larch flowers, which are small and pinkish red before they turn into cones, were used in traditional herbal medicine, and the resin under the bark was used by Native Americans to heal cuts and bruises, soothe sore throats, and when brewed into a tea, to relieve coughs and colds. The ingredient is extracted directly from the trees, making it a natural, bio-available and biodegradable compound that fits perfectly with Annmarie’s vision for natural skin care products. Only heat, pressure, and water are used to extract the good stuff—there are no solvents or other chemicals used in the process. What are the Benefits of Larch Tree Extract? Natural Exfoliator: This is one of the most exciting characteristics of larch extract (or GA) — it helps exfoliate. Reduces the appearance of fine lines and wrinkles: The extract does this in a few ways. The extract helps moisturize and hydrate. Keeps hydration in: As mentioned above, larch tree extract helps form a protective shield on skin to reduce the amount of water that is lost through evaporation. This can be particularly helpful as you go about your day, when the air outside and indoors tries to sap your skin of moisture. Increases skin radiance: All these properties together—exfoliation, moisture retention, and protection—add up to softer, smoother, more radiant skin. You can see why we’re so excited about this addition. If you try the new Anti-Aging Eye Cream, let us know what you think! What do you think of this new ingredient? Please share your results. Do you have anything specifically to help with painful osteoarthritis? ?? We don’t have anything for osteoarthritis, this is often caused by internal inflammation and we do suggest seeing a holistic practitioner to work with these sorts of issues.